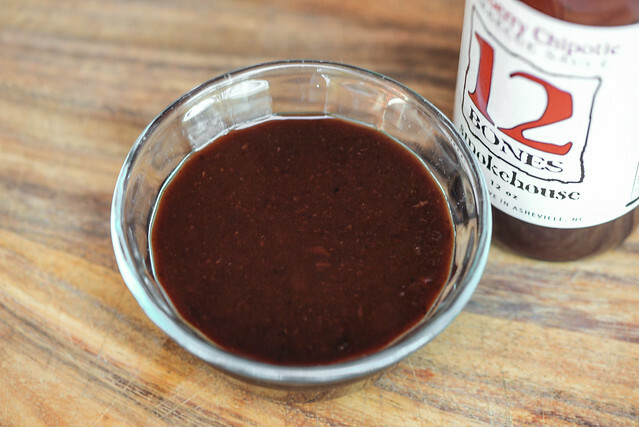 A strong blueberry base sets this sauce apart from the outset, but its the well formed layers of sweet, tangy, smoky, and spicy that make that extra fruity base come together into a great barbecue sauce. 12 Bones Smokehouse has been an Asheville staple since 2005 when Tom Montgomery and Sabra Kelley opened up shop in the River Arts District in the Western North Carolina town. It was already flourishing by the time the Obama's ate their first meal there on the campaign trail in 2008, but repeat visits by the first couple only solidified 12 Bones' reputation as a North Carolina institution in the making. Tom and Sabra sold the business to current owners Bryan and Angela King in 2013, and since then the King's have written a 12 Bones cookbook, furthering the reach and influence of their smokehouse. 12 Bones recently had to move out of their original location, but reopened in a large space nearby, while also operating a second location south of Asheville in Arden. Among the smoked meats this establishment is known for, their unique Blueberry Chipotle sauce is arguably their most recognizable product. A first whiff doesn't do much to discern between tomato and blueberry, but rather the mixture of the two creates a very dominant fruity aroma. There's a natural sweetness that backs-up the fruit, while molasses adds a complexity to the sugars. The tang from vinegar is there, but subdued, while Worcestershire plays pretty heavily in deepening the overall barbecue smell. Also helping out in that department are background notes of onion and garlic. This dark maroon sauce has a glossy sheeny with a slightly textured consistancy. A ton of white and black spice specs can be seen, coming in small and medium sizes. 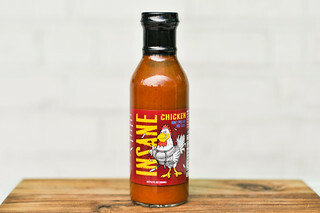 The sauce has a medium thickness and falls in a steady, fast pour from a suspended spoon at first. As additional sauce falls, the pour begins to break up and becomes uneven, switching over to a few fast drips followed by a couple slow ones before ceasing. A medium layer of sauce is left clinging to the silverware. While the aroma of the sauce was nondescriptly fruity, there's no doubt blueberries form the base here on first taste. The berry flavor is strong and sweet at first, which tomato coming in second, upping the fruity profile. Molasses and Worcestershire combine early on to add complexity upfront before a hearty vinegar tartness makes a play and provides a contrast to the sugars. Then things turn mildly smoky before the heat kicks in and imparts a medium burn on the tongue and lips. The blueberries and sweetness persist though, creating an aftertaste that is primarily spicy chipotle, but still has hints of fruit and sugar mixed in. This sauce coated the chicken in a medium, slightly uneven layer that baked down well over indirect heat. When moved to direct heat, the sauce picked up some light caramelization. The heavy hitting fruity flavor persisted and even gained a little dominance thanks to a more pronounced sweetness after being cooked. This gave the chicken a blueberry profile that also had a nice smoky heat backing it up, especially after that spice had time to build up from subsequent bites. This gave a very full, robust flavor to the chicken, but also added a bit of a grittiness from some blueberry bits peppered throughout the sauce. Equating 12 Bones with this sauce is totally just—I've never tasted a sauce quite like it anywhere else. 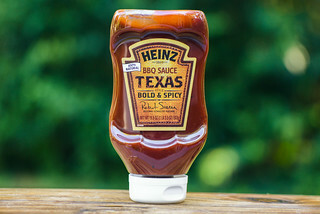 The sauce lives up to its blueberry name with a strong, fresh berry base and has all the makings of a great barbecue sauce thanks to the tomato, vinegar, Worcestershire, molasses, and chipotles that create waves of flavors that make the sauce interesting and complex from start to finish. The only drawback here is the fresh berries add a bit of a gritty texture that was pronounced on the smooth chicken, but would be less noticeable on items like ribs or brisket. 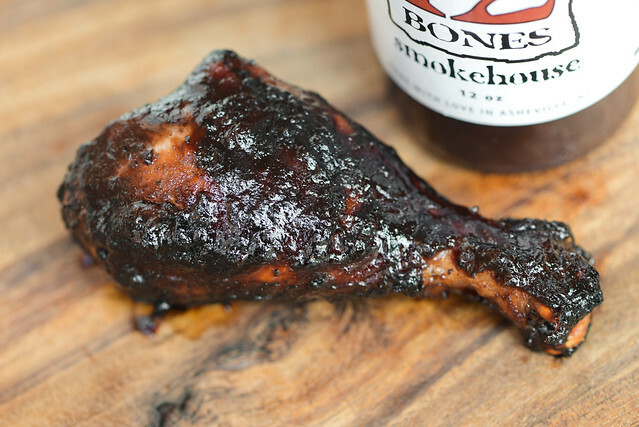 The powerhouse flavor means that sauce will do those heavier smoked meats justice, holding its own while still letting the flavor of the meat shine through. 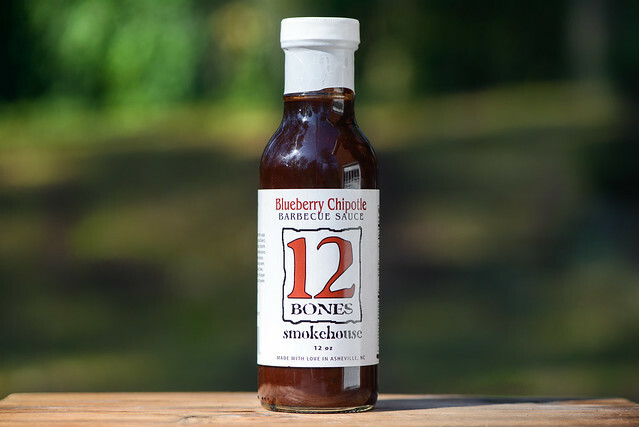 If you're looking for something to really set your barbecue apart from others, look no further than 12 Bones Blueberry Chipotle Barbecue Sauce, which will do the job like none other.